Delta Force Paintball Petrie – Brisbane’s Best Paintball Centre! Delta Force Paintball Petrie has arrived! No longer will the people of Brisbane need to play with boring hay bales and run-down game zones. 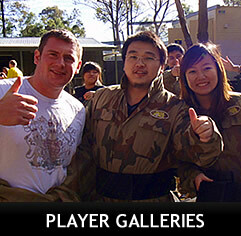 Delta Force offers quality paintball games and experiences unlike any you have ever seen before. We offer competitive paintball packs and safety equipment, while lunch can be purchased from our Basecamp. Renowned for immersive Game Zones and props, Delta Force Paintball has really taken things to the next level at the Petrie location. The signature 30 ft. Egyptian Pyramid in Tomb Raider takes pride of place while the Black Hawk chopper is a crowd favourite. This thing is so real that the Australian Military have approached Delta Force to conduct training missions with it. Other Game Zones include the Viet Cong Village of Tropic Thunder, Zombie v Humans in Resident Evil and Speedball. All players are provided state-of-the-art equipment for both comfort and safety. This includes the custom designed and manufactured 360 degree Fusion Goggles; double-sided Body Armour; full length Overalls including padded ‘Dracula’ collar; and cutting edge Blaze MKII Markers known for accuracy and ease of use. Our fully trained marshals ensure you have a fun and safe day at our centre. We have carefully chosen incredible outback landscapes and designed pro zones which ensure every game you play will be memorable.